At the beginning of this year, we successfully tendered for an interpretation project at Widecombe-in-the-Moor, Devon. The project was funded by Moor than meets the eye – a landscape partnership that is helping people to explore Dartmoor’s past and preserve its future. From the outset, it has been a most enjoyable exercise working with the team leaders and members of the local community, all of whom have been supportive of our proposals and tirelessly assisted in the supply of information, photographs and access to archive material. Our approach was, very largely, to develop Widecombe’s story against a background involving such characters as the village blacksmith and policeman; miners, writers and artists. The result is a series of graphic panels that start with a welcome in the car park by Uncle Tom Cobley – made famous in the song ‘Widecombe Fair’– continue in cafes, shops and inns; and conclude, in the magnificent church of St Pancras, with four displays that cover tin mining, wartime Widecombe, the history of the church and its fascinating roof bosses. Platform One also designed and produced a visitors’ leaflet and map; post-mounted engraved roundels for children to follow a ‘rubbings’ trail; and we are currently developing a booklet that illustrates walks around the village and its immediate environs. No sooner were they up then people were reading them! History panels installed on moveable units in St Pancras Church, Widecombe. Topics included Medieval roof Bosses, Widecombe at Wartime, Tin mining and The Cathedral in the Moor itself. A popular addition to the Church, visitors can be seen pulling up a chair in front of the panels so they can enjoy reading them. Widecombe Fair panel can be found in the Gift shop with a more extended panel housed at the Rugglestone Inn. Our very own pin up made it into the Monmouthshire Beacon this week... along with some of our recent work. We were going to showcase our work at Widecombe today until we received an exciting delivery at Platform One, the arrival of our ceramic poppies, for stage 2 of the Monmouth Poppy Trail. There will be 20 poppies installed on buildings in Monnow Street, all with interesting tidbits relating to the Royal Monmouthshire Royal Engineers (M) during the First World War. The poppies were manufactured for us by Cathryn Yeates, a ceramicist who is based in Monmouthshire. A lovely way to go into the weekend. We'll share our Welcome to Widecombe early next week instead. The 2017 edition of Monmouth Town Maps have now been installed. Hoping our lovely advertisers get lots of extra trade from this Monmouth and District Chamber of Trade and Commerce initiative. Monmouth has lots of wonderful independent shops and businesses and is worth exploring for its hidden courtyards and pedestrian areas. St Thomas’ Church Hall, as part of its development and in homage to a much-loved vicar, has been renamed Ty Price . The building will also be liveried with a new logo, designed by Platform One. The device features a family group incorporated with a shape based on the adjacent Market Cross (circa 1039) and reflecting the new role of the hall as a meeting place for the whole community. The first phase of the Poppy Trail a commemoration to the Royal Monmouthshire Royal Engineers (M) was installed over the weekend. Its highlight is the tableau of Steel Soldiers in the Regimental Garden of Remembrance. The story of the RMRE, since its inception as a militia in 1539, with a special focus on the first World War, is told in a series of panels on the approach to and surrounds of Monmouth Castle and the Regimental Headquarters at Great Castle House. If you ever visit Monmouth, it's worth walking up Castle Hill to the Remembrance Garden, a quiet tranquil spot to see the installation first-hand While there maybe pop into the Regimental Museum which is a hidden gem. New signage for the RMONRE Regimental Museum to complement the Heritage Interpretation. The official starting point of the Poppy Trail. 7 life-size steel soldiers stand as a poignant tribute in the Royal Monmouthshire Royal Engineers, Memorial Garden, behind Monmouth Castle. The installation will change with the seasons, the weathering of the steel and the flowering and withering of the planted Poppies. Tired but happy after the installation! New coffee shop Brew and Grind met with us to discuss a logo design, in readiness for their opening in early 2017. They wanted a modern typographic device with a vintage feel. We provided an initial selection of 12 visuals before whittling them down to a few preferred ideas, which were further developed to reach the final design, shown below. Approved logo for Brew and Grind coffee shop. Contemporary Arts Society of Wales have used us to design their Annual Report and Newsletter since 2002. The report showcases some of the best craft and artworks in Wales and the artists supported by CASW. Last year's edition featured on the cover, a quirky ceramic by Masazumi Yamazaki perched atop a traditional Welsh dresser. CHEEKY CAMPAIGN GETS TONGUES WAGGING! 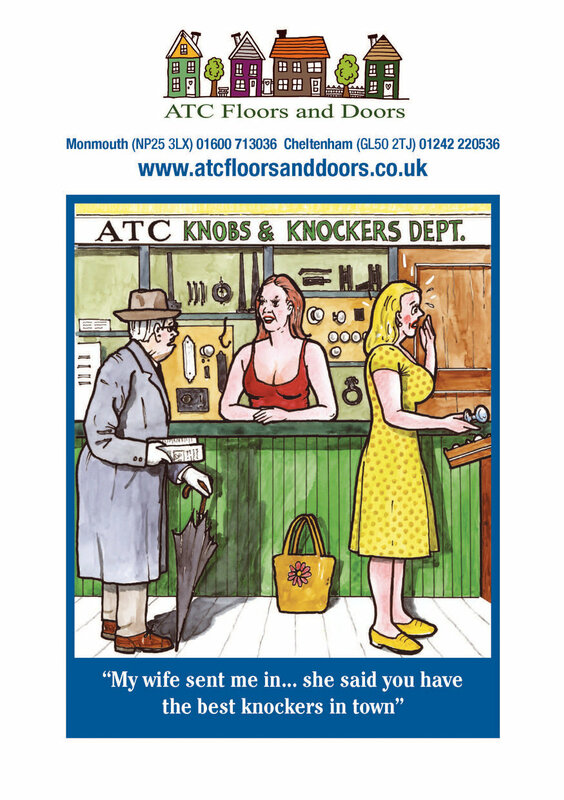 ATC FLOORS AND DOORS commissioned us to refresh their image, starting with their advertising. Their current strapline is 'Get laid in style' - with this in mind we came up with a series of adverts based on 'Comic Seaside Postcards'. We developed our own illustrative style paying homage to Bamforth and Donald McGill. So far we've developed 5 adverts which were turned into posters for County Shows. According to ATC, the campaign is doing the trick and grabbing customers' attention! We're looking forward to progressing the series. Our latest graphic design job for the Haberdashers' Monmouth Schools is a wrapped minibus. Following the success of the service bus we designed for them earlier in 2016, they have added this colourful addition to the roads of Monmouthshire and Gloucestershire. Paul Weeks' Minibus will be seen twice daily during the week, travelling between Monmouth and Tockington. All design and artwork was produced by Platform One (the sides were supplied as a complete file). These were printed and then skillfully applied by Chillipepper Signs, Monmouth. We had a working weekend in London. On Friday evening we installed the Haberdashers' Monmouth Schools' exhibition stand at the Independent Schools Show, Battersea 12 - 13th November 2016. We then dismantled it at the end of the Show and bought it back to Monmouth. Despite a late return we were still back in the office bright and breezy this morning! The approved sketches and a photograph in situ are pictured below to show our consistency from visual to finished product. Our Artfull Puffin Christmas range is now available from online store Giftwrapped and Gorgeous https://www.giftwrappedandgorgeous.com/ArtfullPuffin-products with two lovely new designs for 2016. We've just designed a leaflet for the New Baby Club at Agincourt School which starts in January 2017. 'Free stay and play' for babies and toddlers 0 - 3 years, from January 12th 2017. We will be holding a coffee morning from 10am - 1.30pm on Friday 14th October in order to raise money for Macmillan Cancer Charity. There will be cakes, buns, greetings cards, tea and coffee for sale! Proceeds made will go to Macmillan Cancer Care. Please spread the word in order to get as many people involved and raise as much money as possible for such a good cause! Since the 17th century Monmouth has had a one day County Show. Each year some 20,000 visitors enjoy a taste of farming and the countryside at the stunning showground on the banks of the River Wye. For the past 15 years or so, we have produced the graphics for the Haberdashers' Monmouth Schools' mobile exhibition unit, used at this and other local shows. The village of Raglan in Monmouthshire, has a very proactive community. Following a successful Kickstarter campaign we have just replaced the Raglan Town Map. Visitors can now find their way easily throughout the Town or enjoy a walking trail to see its Historic buildings. Theatr Ardudwy and Flying Bridge Theatre Company commissioned us to produce eye-catching roll-ups to advertise themselves while they were performing at Edinburgh Fringe. We had previously designed all of the 2016 promotional material for 'A Regular Little Houdini's' UK and USA Tours. We'd thoroughly recommend seeing A Regular Little Houdini, if you ever see it advertised at a venue near you: it's a riveting one-man Show. It has been a busy time getting jobs finished for the end of term deadlines, especially for Haberdashers' Monmouth Schools. One project was the design of new bus graphics for which we created visuals and artwork. The sides were printed in one continuous strip, which added a certain complexity (and nervousness) to the generation of our artwork: we needed to ensure accuracy to allow for figures leaning on the edge of the bus or running onto door panels. It's always rewarding to see our design being used for what it was intended. So, we were delighted to see this picture of our work, in-situ at the Country Life Future Schools Fair. We designed the display graphics, leaflets, bags, business cards, tablecloth and counter wrap.